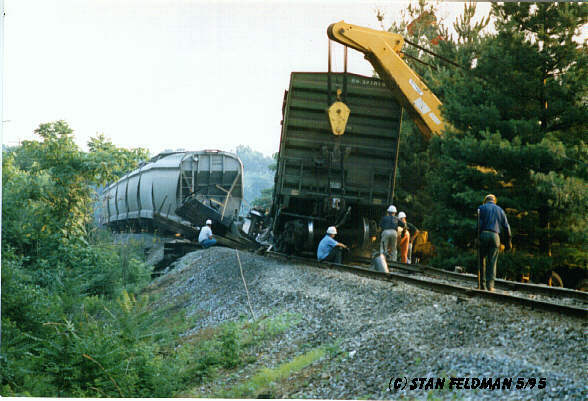 Derailment and Accident Page-1 of 4;-Stan's RailPix. Derailment and Accident Page 1 of 4. -Click here to see the last 2 cars of a 64-car Norfolk Southern train ( CAAL-4) that derailed on the Conrail Richmond Industrial Track, at Allegheny Avenue. This is about 1 mile south-west of Frankford Junction, Phila. PA. One tank car containing Phenol fell on to Allegheny Avenue, narrowly missing a small truck. The car fell on its dome, and that is where the car was leaking from. Crews from the Sun Company were on the scene along with the Philadelphia Fire Department. This could have been much worse. This area is heavily populated, and Northeastern Hospital is one block away from the derailment. 9/14/99. 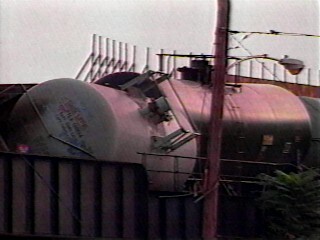 -Click here for derailment images.- There has been another derailment of tank cars on the Conrail Richmond Industrial Track in Philadelphia. 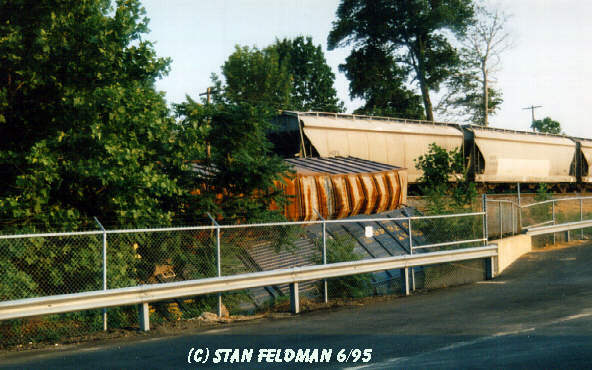 Late Friday afternoon on 11/19/99, 2 tank cars derailed on an embankment near the bridge over East Tioga Street. One car was perched on the edge of the embankment, and leaked a small amount of a hazardous chemical. Crews plugged the leak quickly, and there where no injuries reported. Crews from the Sun Company, Conrail, and the Philadelphia Fire Dept. were on the scene. The clean-up is expected to be done before daybreak. As of 11:00pm, equipment was on location to lift the cars back on the tracks. About 8 homes and 1 business where evacuated. 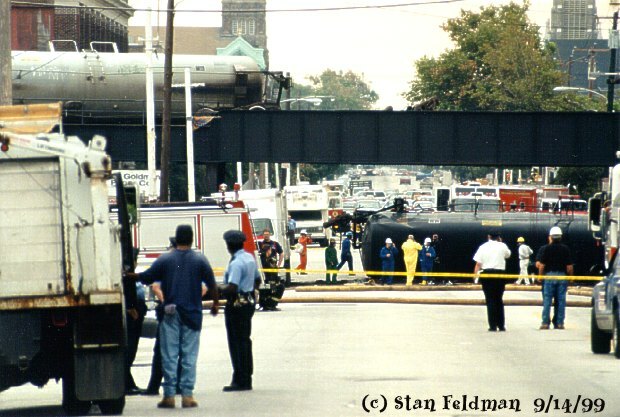 The Red Cross set up a shelter at the Webster School on Frankford Ave. On 9/14/99, A tank car derailed and fell onto Allegheny ave, which is about 4 blocks from this derailment site. 11/19/99. 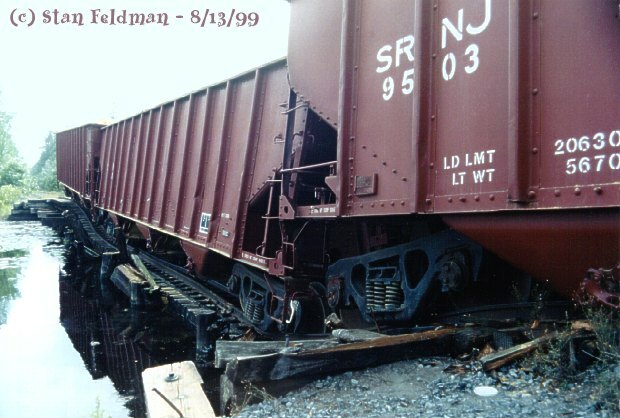 -Click here to see 3 Southern Railroad Company of New Jersey (SRNJ) hopper cars, on the collapsed Hospitality Branch Bridge. The locomotive and first 3 cars of the 6 car train passed over the bridge without any problems. 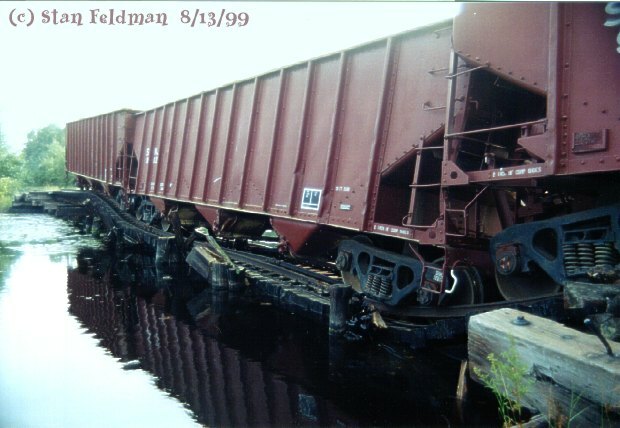 The bridge collapsed under the fourth and fifth cars. The train was hauling sand and was going to Winslow Junction. 8/13/99. -Click here for a wide view of 3 Southern Railroad Company of New Jersey (SRNJ) hopper cars, on the collapsed Hospitality Branch Bridge. The bridge is on the Southern Running Track, which is leased from The State Department of Transportation. It was part of a Jersey Central Railroad route that went from Bridgeton to Jersey City N.J. 8/13/99. Click here to see a crew working to clear a derailment on the Conrail Bustleton Branch in Phila. Pa., 6/19/95 . The branch was out of service for 2 days after the accident. 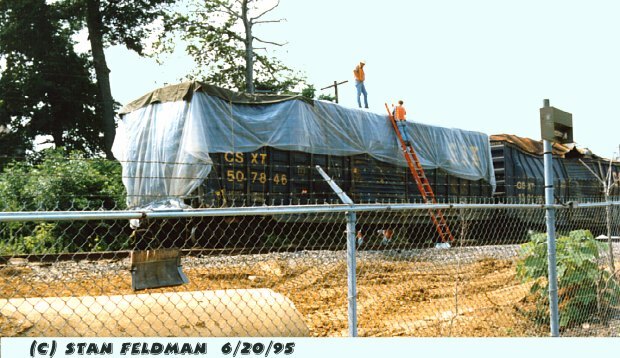 Click here to see 2 damaged boxcars back on the tracks and being prepared for movement, the day after the derailment. Conrail Bustleton Branch, Philadelphia Penna. 6/20/95. 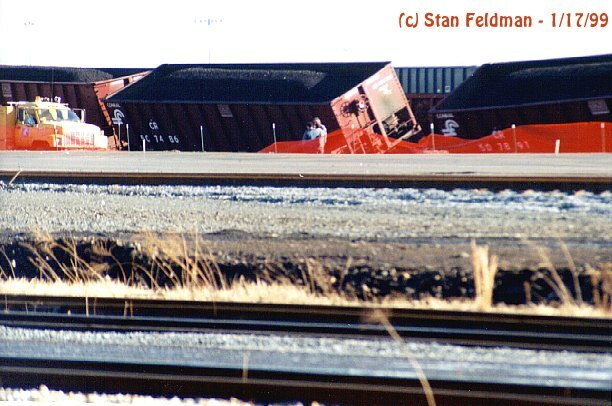 Click here for a wide view of derailed Conrail hopper cars, in the middle of a train. Conrail (CSX) Greenwich Yard, Phila. Pa. 1/17/99. 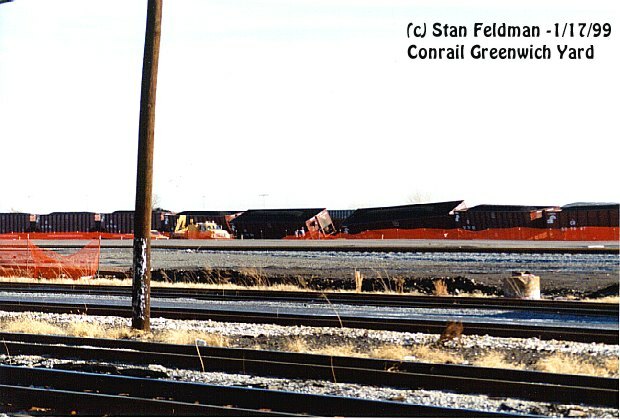 Click here for a close view of derailed Conrail hopper cars in The Conrail (CSX) Greenwich Yard in Phila. Pa. Several cars did derail, but they did not turn over or spill the loads. 1/17/99.